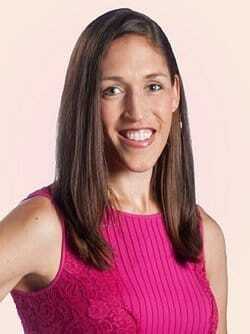 Both on and off the court, Rebecca Lobo personifies success. As the 1995 consensus National Player of the Year, Ms. Lobo led the University of Connecticut Women's Basketball team to its first National Championship. In 1996, she won a gold medal as the youngest member of the U.S. Women's Olympic Basketball Team, before embarking on a successful seven-year WNBA career. In her senior year as team captain, and consensus National Player of the Year, Lobo led the University of Connecticut Women's Basketball team to a perfect season and its first National Championship in 1995. The Huskies were undefeated in 28 regular-season games and defeated Tennessee in the NCAA Championship that year to go 35-0. Lobo gained many accolades off the court as well. In 1995 she was named Female Athlete of the Year by the Associated Press, NCAA Women's Basketball Player of the Year; Woman of the Year by the Women's Sports Foundation, and she also received an ESPY for Outstanding Female Athlete. Lobo was named a Rhodes Scholar candidate, the 1995 Academic All-America of the Year in women's basketball and the Co-Academic All-America of the Year for all teams in the University Division. A member of the 1996 U.S. Women's Basketball Olympic Team during the Summer Olympic Games in Atlanta, the team won a gold medal. The following year in 1997, the WNBA began its inaugural season, which Lobo was one of the first players to sign with one of its franchises - the New York Liberty. She played with the Liberty until 2002 then went on to play for the Houston Comets and ultimately retired with the Connecticut Sun in 2003. Rebecca joined ESPN in 2004 as a WNBA and women's college basketball analyst and reporter. The former WNBA All-Star and championship winning college basketball player contributes to ESPN's live women's basketball events and studio shows. Lobo has been actively involved in the community with various philanthropic endeavors, including founding the "RuthAnn and Rebecca Lobo Scholarship in Allied Health" at UConn in 2001. She has served on the University of Connecticut Board of Trustees since 2004. Lobo and her mother RuthAnn collaborated in 1996 on a book entitled The Home Team: Of Mothers, Daughters, and American Champions. The book covers Lobo's career as well as her late mother's battle with breast cancer. She also contributed a short story to an anthology entitled 33 Things Every Girl Should Know. For her outstanding performance in and out of the classroom as a student-athlete, in June 2008, Lobo was inducted into the College Sports Information Directors of America Academic All-America Hall of Fame. In 2010, she was inducted into the Women's Basketball Hall of Fame in Knoxville, Tennessee, and in 2013 she joined Hartford Hospital's Board in 2013. Rebecca is married to Sports Illustrated columnist Steve Rushin. The couple lives in Connecticut with their four children. In this presentation, Rebecca recounts her success as a player for National Championship winning college basketball team and Gold-Medal winning Olympic basketball team as well as her years spent reporting for ESPN. Rebecca shares a lot of fun stories about growing up as an extremely tall female basketball player, meeting the last three Presidents of the United States (including riding on Air Force One, jogging with President Bill Clinton, attending Bush White House Christmas Parties and filling out the NCAA tournament brackets with President Barack Obama) and balancing a career while raising four children. In this program, Rebecca tells how her time spent on the court as a basketball player as well as off the court as a broadcaster helped build stronger connections with her peers.